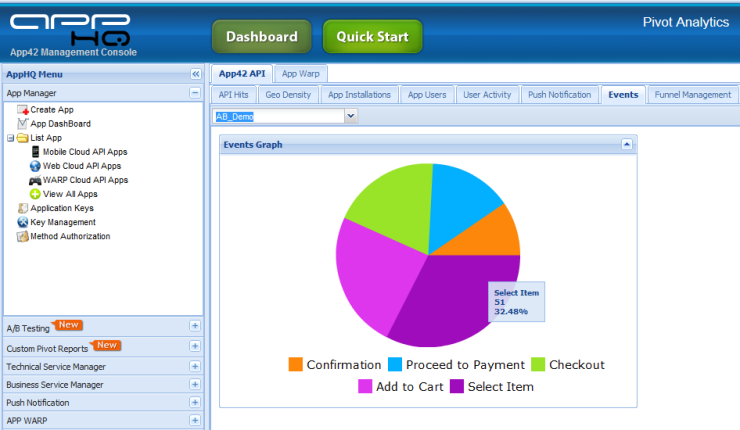 Using App42 platform, one can track app events and analyze those events. This will help in taking informed business decision and can be helpful in increasing conversion in your app. At occurrence of an event (For example, the user clicked on a Add To Cart button inside your app), one can log events using setEvent method available in logging service as shown below. Similarly you can log other events at the time of occurrence. Logged events report can be seen in Marketing Automation console as shown below. It is available in User Insights > Live View. Please refer the below screenshot.It will give you pie distribution of each event happened inside your app.